What comes to your mind when you think of mother? It may not be a pleasant thought if your mother failed to show love and concern for your life, but the word mother was meant to bring warm thoughts to the hearts of her children. 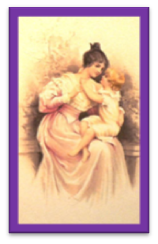 If you did not have a loving mother, for one reason or another, remember, whatever God withholds, He supplies in Himself. The word mother means “bond of the family”. She was created to help meet the needs of mankind. God made woman to birth life. Eve’s name means “life giver”. She is the life of the home. As the saying goes, “If mother aint’ happy, aint’nobody happy!” A mother has the opportunity of bringing the children and the father together by the example she gives in the way she loves the father. If she doesn’t love him, the children will need to go around mother to get to the father. If she does not respect the father, then the children will likely not respect either one. If the mother is not working through the father, then there are two masters and the Bible says,”no man can serve two masters”. But a godly mother does not divide her home. She works at bringing the home together. Our homes are not destroyed from the outside. When parents are one in heart and they look to God in prayer for their lives, the enemy cannot get inside. Gloria and I did family seminars for years, which were titled, “Home, A Shelter in the Time of Storm”. You should feel safe and secure in your home. The mother and father’s relationship determines whether the family lives in peace or in strife. Mothers play such an important job in the making of lives. Many women cannot give birth to children, but all women can mother children. Many times the mother who could not give birth, applies herself better to the job of weaning the children, than the mother who births many. To rear a child who has learned self control and a respect and honor for God, is to rear a child that will make the world a better place to live. It is the mother’s opportunity to produce great men and women as she feeds, clothes and nourishes her children. We must insert here that not all children will live what they are taught. Even our perfect God has rebellious children! Yet, when you know that you have applied yourself and have done the best you could, you do not live in guilt because of their decisions. When we do a halfway job of raising our children, we always wonder if we could have made a difference. I would like to stop here and thank all of the godly mothers for the work they do for their husbands and the children of man. God says a wife is a good thing. My mother had four children and one on the way when my father left home. Mother loved her children and worked day and night to see to it they had food and clothing. She was diligent to teach discipline and to teach us how to work hard. I can’t imagine how hard her days were, but she never turned from her responsibilities. Mother was only 4’11” but she could take care of herself. I was her only son and I grew to almost 6′, but that didn’t mean I could (or would) out do mother. My sisters and I respected her highly and never thought about being mean or disrespectful to her. Mother had been raised with her father and four brothers. Her sister left home when mother was nine years old and her mother had died giving birth to her last son. My mother, at nine years of age, was left to raise the baby. Her father loved his children, but was very harsh with them. Mother had the responsibility of cooking the meals. Her father held her responsible for having the hot foot on the table when he came home. He worked in the fields and she would watch out the window to see when he would come. As she saw him coming she would get the food to the table. She had to have a chair to reach the stove. Mother’s father died when she was in her early teens and she had to go live with her married brothers. She had no place to call home, so when the neighbor boy ask her to marry him, she said, “Yes!” They had been married almost 20 years when he left. Sometimes life is not easy, but life did not keep my mother from being a good mother! There is no reason to justify being less than God requires of you. We can do all things through Christ which strengthens us!!! This is Gloria’s first Mother’s Day without a mother. Both of us have lost our parents to death. YET, they are not in the grave, but are with the Lord in heaven, waiting for the Lord to return to earth to get us. We will be together again. But until then, we need to be everything the Lord desires us to be in order to make a difference in the lives of those we are given to serve. Children, write your mother a note, and tell her what you love about her. If you do not have a mother, but know someone who loves you like a mother, write them a note. Tell them what they mean to you. Give your roses while they live. Husbands, love your wives as you love yourselves. Know your wife and you will always know her needs. Seek to understand her value to your life. How long has it been since you told her you loved her? Tell her every day; she may forget! If God had not taken Eve out of Adam, we men would never have known that we had it in us! She is the good thing that came straight from us men. May God bless every mother this Mother’s Day who has sacrificed herself to build man’s home and serve his life; who has, with love, served the lives of her children.